Far from conspiring with the convicted Bosnian-Serb leader Radovan Karadzic, Milosevic actually „condemned ethnic cleansing“, opposed Karadzic and tried to stop the war that dismembered Yugoslavia. Buried near the end of a 2,590 page judgement on Karadzic last February, this truth further demolishes the propaganda that justified Nato‘s illegal onslaught on Serbia in 1999. Milosevic died of a heart attack in 2006, alone in his cell in The Hague, during what amounted to a bogus trial by an American-invented „international tribunal“. Denied heart surgery that might have saved his life, his condition worsened and was monitored and kept secret by US officials, as WikiLeaks has since revealed. Milosevic was the victim of war propaganda that today runs like a torrent across our screens and newspapers and beckons great danger for us all. He was the prototype demon, vilified by the western media as the „butcher of the Balkans“ who was responsible for „genocide“, especially in the secessionist Yugoslav province of Kosovo. Prime Minister Tony Blair said so, invoked the Holocaust and demanded action against „this new Hitler“. David Scheffer, the US ambassador-at-large for war crimes [sic], declared that as many as „225,000 ethnic Albanian men aged between 14 and 59“ may have been murdered by Milosevic‘s forces. This was the justification for Nato‘s bombing, led by Bill Clinton and Blair, that killed hundreds of civilians in hospitals, schools, churches, parks and television studios and destroyed Serbia‘s economic infrastructure. It was blatantly ideological; at a notorious „peace conference“ in Rambouillet in France, Milosevic was confronted by Madeleine Albright, the US secretary of state, who was to achieve infamy with her remark that the deaths of half a million Iraqi children were „worth it“. Albright delivered an „offer“ to Milosevic that no national leader could accept. Unless he agreed to the foreign military occupation of his country, with the occupying forces „outside the legal process“, and to the imposition of a neo-liberal „free market“, Serbia would be bombed. This was contained in an „Appendix B“, which the media failed to read or suppressed. The aim was to crush Europe‘s last independent „socialist“ state. 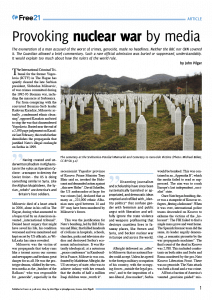 Once Nato began bombing, there was a stampede of Kosovar refugees „fleeing a holocaust“. When it was over, international police teams descended on Kosovo to exhume the victims of the „holocaust“. The FBI failed to find a single mass grave and went home. The Spanish forensic team did the same, its leader angrily denouncing „a semantic pirouette by the war propaganda machines“. The final count of the dead in Kosovo was 2,788. This included combatants on both sides and Serbs and Roma murdered by the pro-Nato Kosovo Liberation Front. There was no genocide. The Nato attack was both a fraud and a war crime. All but a fraction of America‘s vaunted „precision guided“ missiles hit not military but civilian targets, including the news studios of Radio Television Serbia in Belgrade. Sixteen people were killed, including cameramen, producers and a make-up artist. Blair described the dead, profanely, as part of Serbia‘s „command and control“. In 2008, the prosecutor of the International Criminal Tribunal for the Former Yugoslavia, Carla Del Ponte, revealed that she had been pressured not to investigate Nato‘s crimes. This was the model for Washington‘s subsequent invasions of Afghanistan, Iraq, Libya and, by stealth, Syria. All qualify as „paramount crimes“ under the Nuremberg standard; all depended on media propaganda. While tabloid journalism played its traditional part, it was serious, credible, often liberal journalism that was the most effective - the evangelical promotion of Blair and his wars by the Guardian, the incessant lies about Saddam Hussein‘s non-existent weapons of mass destruction in the Observer and the New York Times, and the unerring drumbeat of government propaganda by the BBC in the silence of its omissions. At the height of the bombing, the BBC‘s Kirsty Wark interviewed General Wesley Clark, the Nato commander. The Serbian city of Nis had just been sprayed with American cluster bombs, killing women, old people and children in an open market and a hospital. Wark asked not a single question about this, or about any other civilian deaths. Others were more brazen. In February 2003, the day after Blair and Bush had set fire to Iraq, the BBC‘s political editor, Andrew Marr, stood in Downing Street and made what amounted to a victory speech. He excitedly told his viewers that Blair had „said they would be able to take Baghdad without a bloodbath, and that in the end the Iraqis would be celebrating. And on both of those points he has been proved conclusively right.“ Today, with a million dead and a society in ruins, Marr‘s BBC interviews are recommended by the US embassy in London. This obeisance to the United States and its collaborators as a benign force „bringing good“ runs deep in western establishment journalism. It ensures that the present-day catastrophe in Syria is blamed exclusively on Bashar al-Assad, whom the West and Israel have long conspired to overthrow, not for any humanitarian concerns, but to consolidate Israel‘s aggressive power in the region. The jihadist forces unleashed and armed by the US, Britain, France, Turkey and their „coalition“ proxies serve this end. It is they who dispense the propaganda and videos that becomes news in the US and Europe, and provide access to journalists and guarantee a one-sided „coverage“ of Syria. Having created and underwritten jihadism in Afghanistan in the 1980s as Operation Cyclone - a weapon to destroy the Soviet Union - the US is doing something similar in Syria. Like the Afghan Mujahideen, the Syrian „rebels“ are America‘s and Britain‘s foot soldiers. Many fight for al-Qaida and its variants; some, like the Nusra Front, have rebranded themselves to comply with American sensitivities over 9/11. The CIA runs them, with difficulty, as it runs jihadists all over the world. The nuclear risk is obvious, though suppressed by the media across „the free world“. The editorial writers of the Washington Post, having promoted the fiction of WMD in Iraq, demand that Obama attack Syria. Hillary Clinton, who publicly rejoiced at her executioner‘s role during the destruction of Libya, has repeatedly indicated that, as president, she will „go further“ than Obama. Gareth Porter, a samidzat journalist reporting from Washington, recently revealed the names of those likely to make up a Clinton cabinet, who plan an attack on Syria. All have belligerent cold war histories; the former CIA director, Leon Panetta, says that „the next president is gonna have to consider adding additional special forces on the ground“. In Britain, the Guardian‘s Luke Harding leads his newspaper‘s Russia-haters in a stream of journalistic parodies that assign to Vladimir Putin every earthly iniquity. When the Panama Papers leak was published, the front page said Putin, and there was a picture of Putin; never mind that Putin was not mentioned anywhere in the leaks. Like Milosevic, Putin is Demon Number One. It was Putin who shot down a Malaysian airliner over Ukraine. Headline: „As far as I‘m concerned, Putin killed my son.“ No evidence required. It was Putin who was responsible for Washington‘s documented (and paid for) overthrow of the elected government in Kiev in 2014. The subsequent terror campaign by fascist militias against the Russian-speaking population of Ukraine was the result of Putin‘s „aggression“. Preventing Crimea from becoming a Nato missile base and protecting the mostly Russian population who had voted in a referendum to rejoin Russia - from which Crimea had been annexed - were more examples of Putin‘s „aggression“. Smear by media inevitably becomes war by media. If war with Russia breaks out, by design or by accident, journalists will bear much of the responsibility. In the US, the anti-Russia campaign has been elevated to virtual reality. The New York Times columnist Paul Krugman, an economist with a Nobel Prize, has called Donald Trump the „Siberian Candidate“ because Trump is Putin‘s man, he says. Trump had dared to suggest, in a rare lucid moment, that war with Russia might be a bad idea. In fact, he has gone further and removed American arms shipments to Ukraine from the Republican platform. „Wouldn‘t it be great if we got along with Russia,“ he said. This is why America‘s warmongering liberal establishment hates him. Trump‘s racism and ranting demagoguery have nothing to do with it. Bill and Hillary Clinton‘s record of racism and extremism can out-trump Trump‘s any day. (This week is the 20th anniversary of the Clinton welfare „reform“ that launched a war on African-Americans). As for Obama: while American police gun down his fellow African-Americans the great hope in the White House has done nothing to protect them, nothing to relieve their impoverishment, while running four rapacious wars and an assassination campaign without precedent. The CIA has demanded Trump is not elected. Pentagon generals have demanded he is not elected. The pro-war New York Times - taking a breather from its relentless low-rent Putin smears - demands that he is not elected. Something is up. These tribunes of „perpetual war“ are terrified that the multi-billion-dollar business of war by which the United States maintains its dominance will be undermined if Trump does a deal with Putin, then with China‘s Xi Jinping. Their panic at the possibility of the world‘s great power talking peace - however unlikely - would be the blackest farce were the issues not so dire. In Britain, Jeremy Corbyn has also excited hysteria from the war-makers in the Labour Party and from a media devoted to trashing him. Lord West, a former admiral and Labour minister, put it well. Corbyn was taking an „outrageous“ anti-war position „because it gets the unthinking masses to vote for him“. In a debate with leadership challenger Owen Smith, Corbyn was asked by the moderator: „How would you act on a violation by Vladimir Putin of a fellow Nato state?“ Corbyn replied: „You would want to avoid that happening in the first place. You would build up a good dialogue with Russia... We would try to introduce a de-militarisation of the borders between Russia, the Ukraine and the other countries on the border between Russia and Eastern Europe. What we cannot allow is a series of calamitous build-ups of troops on both sides which can only lead to great danger. “ Pressed to say if he would authorise war against Russia „if you had to“, Corbyn replied: „I don‘t wish to go to war - what I want to do is achieve a world that we don‘t need to go to war. “ The line of questioning owes much to the rise of Britain‘s liberal war-makers. The Labour Party and the media have long offered them career opportunities. For a while the moral tsunami of the great crime of Iraq left them floundering, their inversions of the truth a temporary embarrassment. Regardless of Chilcot and the mountain of incriminating facts, Blair remains their inspiration, because he was a „winner“. Dissenting journalism and scholarship have since been systematically banished or appropriated, and democratic ideas emptied and refilled with „identity politics“ that confuse gender with feminism and public angst with liberation and wilfully ignore the state violence and weapons profiteering that destroys countless lives in faraway places, like Yemen and Syria, and beckon nuclear war in Europe and across the world. If you could hear, at every jolt, the blood Come gargling from the froth-corrupted lungs, Obscene as cancer, bitter as the cud Of vile, incurable sores on innocent tongues, My friend, you would not tell with such high zest To children ardent for some desperate glory, The old lie: Dulce et decorum est Pro patria mori. Since quite some time it has become obvious, how the media stoke the fires of internal tensions and stir conflicts where there are or should be none. The majority of people in Germany, even in all of Europe, have no problem with Russia and the idea of cooperation with Russia. This conflict is superimposed on us. The same applies to the carefully selected news-items that reach the eyes and ears of our politicians, because they, their thinking and acting is determined by the media and the news, they receive. Therefore our best hope is indeed Putin, who is relatively independent from our media. However if the NATO-states are pressured, gang-hoed into a “preemptive” first strike, then even Putin can’t help us any longer.